Elaine Hancock (Olney, United States) on 18 September 2013 in Miscellaneous. The next few pictures were taken in the train yard and in the town of Sykesville. They made a great use of complementary colours. De belles couleurs en contraste. What a beauty this is - my eye goes straight to the peeling paint. What is it about peeling paint ?! Quelle manivelle jaune et ce bleu merivlleux. Great ! very god seen. très belles teintes, j'en ai comme celles-là que je posterai peut-être plus tard. Je me demande à quel point cela changerait la compositions en croppant plus haut, moi c'est ce que j'aurais fait, ni vu, ni connu. Excuse me, I wanted to say very GOOD seen. I've eaten a letter, sorry ! A fine train shot. I like the vivid colors and the shadows that create sections. Fine work. Excellent framing, I like the combination of colors, they are superb. Beautiful light and fantastic shadow , I love it. De très belles couleurs vives pour cette composition! I love the contrasts and bright colours of your composition! Superb! Gorgeous - I like the way you used the light and shadow. The contrasting colors are lovely. Un superbe détail aux couleurs vives!!! so beautiful frame, colors, lights, shadows & details! Excellent shapes, shadow and colors. Wonderful photo ... 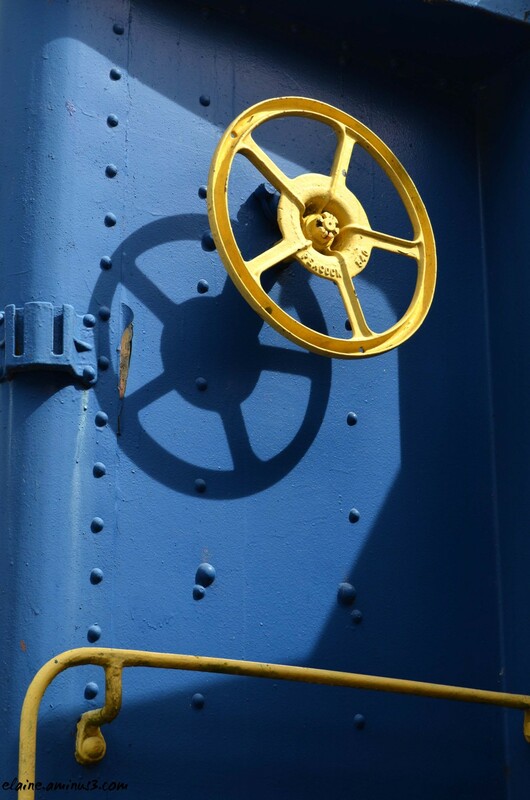 I'm always interested by the history of the trains at the train yard ... great colors and graphic!